FLESHGOD APOCALYPSE Will Debut New Music Onboard! Due to unforeseeable delays in the studio, FLESHGOD APOCALYPSE will not be ready to play their new album for you as planned. As a very special treat, those of you on board will witness the first live performance of unreleased tracks from FLESHGOD APOCALYPSE’s upcoming album, only on board 70000TONS OF METAL, The Original, The World’s Biggest Heavy Metal Cruise! Sailors! You will have the opportunity of attending the exclusive World premiere playback of ONSLAUGHT’S new single and video “A Perfect Day To Die”, only on board 70000TONS OF METAL, The Original, The World’s Biggest Heavy Metal Cruise! The rest of the World will have to wait! We are proud to announce that once again we will be having a star-studded cast of musicians from around the Globe jam on board Round 9 of 70000TONS OF METAL! Jamming In International Waters will take place on Super Metal Sunday, February 3rd, 2019, and will be hosted by Alexander Krull (of ATROCITY and LEAVES’ EYES) and Charlotte Wessels (of DELAIN). Heavy Metal History will be written once again on board The Original, The World’s Biggest Heavy Metal Cruise! This fan favorite event will feature numerous Heavy Metal hit songs from several genres and is sure to be an event that any Sailor on board does NOT want to miss! Click Here to see the full 2019 All Star Jam Setlist! Exclusive SUBWAY TO SALLY Album Listening Party! 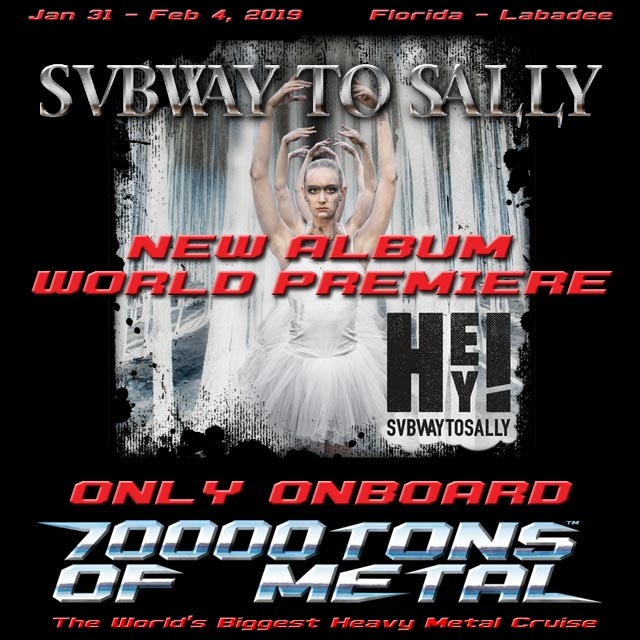 Subway To Sally’s 13th studio album “HEY!” will not be released until March 8, 2019, but Sailors on board Round 9 of 70000TONS OF METAL, The Original, The World’s Biggest Heavy Metal Cruise will hear all twelve tracks from the album before the rest of the World! 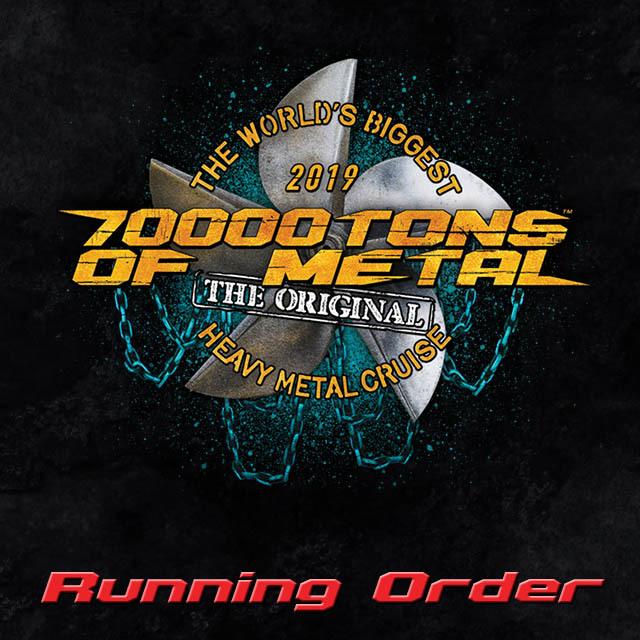 The Running Order for 70000TONS OF METAL 2019, The Original, The World’s Biggest Heavy Metal Cruise is now online. To see the running order, please click here.